One of the most inspiring traditions was attending chapel to listen to the Chapel Choir under J. William Jones and to hear outstanding speakers. One speaker I’ll never forget was Mr. Kraft of the Kraft cheese company, who recounted how he started his business making neighborhood deliveries with horse and buggy. I loved to hear the Chapel organ booming loudly. It filled my soul! The fraternity serenades to commemorate the pinning of or engagement to a coed by the brothers—especially on a beautiful, warm, spring evening with the fragrance of the orange blossoms in the air and a romantic moon in the sky. I find chapel to have been unifying … and those common experiences as a community twice a week frequently resulted in interesting discussions at lunch in the Commons or with professors asking questions about that day’s chapel lecture or sermon. The Feast of Lights and singing in the choir our senior year. In the 1950s, all first-year students were required to wear maroon and grey beanies during the first several weeks and say “hello” to every student they met on campus. Thus, the “hello spirit” was instilled in each and every student and carried throughout the entire U of R experience. Gamma Nu fraternity members standing in front of a women’s dorm on a Monday evening singing their sweetheart song to the couple on the steps who had announced their pinning or engagement. After each U or R touchdown, we would yell the “Och Tamale,” and varsity song leaders, Sharon Annin ’54, Marilyn Hall Beckett ’54, Rae Lane Laffin ’54, and Mary Rector Russell ’54, would do their dance routine with crepe-paper pom-poms. As a freshman, I had to walk around the Commons holding a knife sticking up from my forehead saying, “I’m a Capricorn” over and over. Rather embarrassing, but of course, fun! Och Tamale. The annual spring water fight between the men’s side of the campus and the women’s side of campus. Anderson Hall stealing the Fairmont Rock, giant surgical-tube slingshots flinging water balloons off the sun deck, Wednesday-night stomps, Theater Off Left, and riding bicycles through the orange groves. 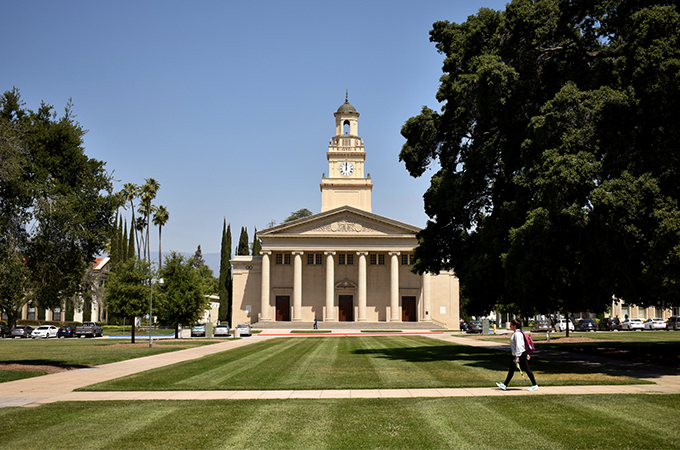 After a momentous event like the end of finals week or the last performance of Feast of Lights, my classmate, Karol Vigil ’80, and I ran up to the administration building steps and yelled across the to the Memorial Chapel. Whatever we yelled would echo back to us. Sometimes, we’d yell, “I love you” or “We did it!” We’d yell about whatever accomplishment we just achieved, and we did this every year. I don’t think we realized it was a tradition until we found ourselves doing it when we were alumni visiting campus together. Donut runs in the late-night hours to Donut Hut in Mentone, Tuesday-night Stomp, and L.A. band concerts in the Greek Theatre. Painting the rock in front of Fairmont Hall—the residents would spray us with water.